Ty-Rap® - Buckle-up fast. It’s going to be a blast! The Ty-Rap® promotion that you have been waiting for is back! cable ties and get a chance to win an exciting mud and race experience! 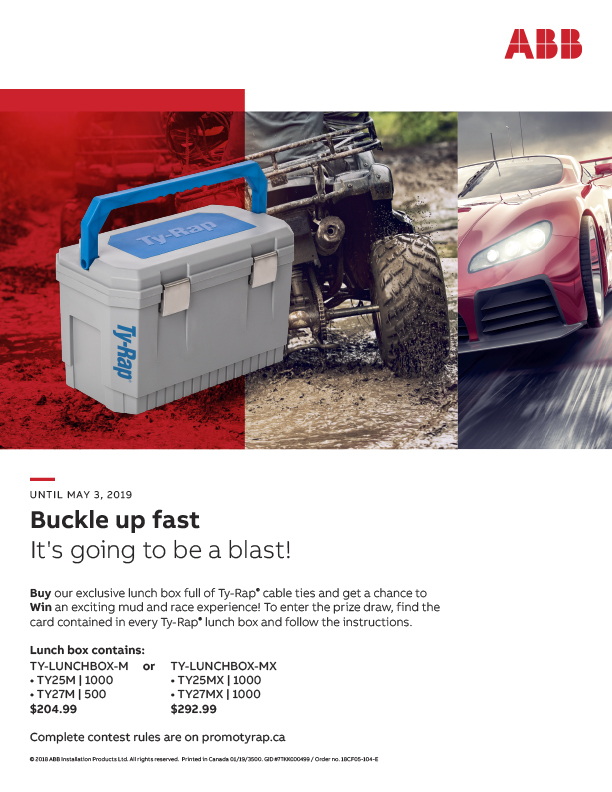 To enter the prize draw, find the card contained in every Ty-Rap® lunch box and follow the instructions. Complete rules are available at promotyrap.ca. The new PRO-BLUTM 933TM wire connector was developed with the installer’s needs in mind. Cylindrical design with no exposed flat surfaces to prevent the collection and retention of liquids or debris. No screws to turn, just push down the lid and it snaps in place! MopTiteTM cover with factory-installed gaskets, meets UL scrub-water exclusion requirements for carpet, tile and wood. Extracts from the CEC and NEC and more. Meets the CEC and cULus requirements for “extra-duty” outlet box covers while being rated for liquid ingress protection and corrosion resistance in environments that require daily washdown. NSF certified design. A complete line of connectors that meets the latest, most robust standard to date for substation grounding. Speed and ease of installation make the NPG Quick-Connect™ cable gland the ideal choice for panel builders and volume installers, as the ease of installation comes with no reduction in performance. To enhance ease of installation, ABB introduces it's newest innovation—SuperMag magnetic fittings for its Superstrut® metal framing line. Powerful, nickel-plated magnets embedded in the most popular Superstrut steel fittings, including square washers, L-brackets, T-brackets and 90° angle brackets, secure the fitting to the strut during assembly. Acting as a third hand, SuperMag fittings allow the installer to work more efficiently and safely with tools and hardware. Superstrut SuperMag magnetic fittings—another innovation from ABB to help make installation safer, easier and more convenient. Stock one design for all hold-down and expansion needs. The innovative new combination hold-down/expansion-guide clamp from ABB can be used on all series of T&B Cable Tray, regardless of side rail thickness. In addition to the dual hold-down and expansion functions, the clamp offers increased pull resistance for vertical applications. The anti-rotation design holds the clamp in place when tightening. The clamp ends are labeled “CLAMP” and “GUIDE” for easy identification. Steel City® - The ALL-IN-ONE Kit! The box and cover kit for Decora or GFCI outlets with raised ground screws makes an easy installation! We are pleased to announce the re-launch of our Ty-Duct™ Wiring Duct. We want you to be aware of the following modifications. Recessed service, 3-gang poke-through designed to fit in 6-in. holes in the second floor and above in commercial buildings. Furniture feed poke-through designed to fit in 6-in. holes in the second floor and above in commercial buildings. The PE2-CS integrated pedestal saves installation time and is ideal in applications such as street and highway lighting, park and recreational facilities, irrigation control systems and many more. Saint-Jean-sur-Richelieu, Qc, November 2, 2016 – ABB Installation Products Canada was today awarded the Integrated Marketing award for its T&B PowerTrain™ program at the EFC Marketing Awards presentation held today in Toronto, Ontario. This award, sponsored by Kerrwil, recognizes excellence in integrated marketing in the category of Electro-Federation Canada (EFC) members with sales greater than $50 million. Launched in December 2015, T&B PowerTrain™ is an online training program designed specifically for electrical distribution employees. Available in English and French, the program delivers comprehensive product training on ABB products in an engaging and interactive manner. With nine training modules currently available and four modules to be added before year end, the program now has more than 1,100 registered users. Iberville® CI2275 duplex fitting with captive cover screw. No more loose or lost screws! New 90 – degree duplex fitting, fits in tight spaces and installs quickly. Microlectric® meter sockets lead the market with innovative, time-saving features. Thomas & Betts introduces three enhancements to the popular CO Series combination meter sockets/breaker units. Keep on-hand at the counter. Save contractors time and money for on-site repairs of damaged and lost parts. Six different replacement kits are available and come with the following accessories for our top meter sockets sold across Canada. T&B® Industrial Fittings - Quick-Connect™ Liquidtight Fittings Push. Tighten. Done! The quality of the our Liquidtight system in a labour-saving Quick-Connect™ fitting. Innovative push-in technology with a captive sealing ring makes it installation-ready. Flexible conduit is used in a wide variety of challenging environments. You need fittings to match.That’s why ABB offers four different liquidtight lines, including our new time-saving, Quick-Connect™ fittings. Get the job done in half the time, save on your installation cost, increase your routing flexibility. The NEW ultra-robust Super-Duty Splice Plate™ allows cost-efficient expansion splicing by reducing the need for supports. Engineers, end-users and contractors benefit from signiﬁcant cost reductions without sacriﬁcing quality or structural integrity. Iberville® Better than ever, Snap-it® nonmetallic fitting now available in 1/2 and 3/4 in. Superior pullout performance and cost efficiency! Now offered in 1/2 and 3/4 in. The future has arrived. Be ready to respond. Developed to meet the increasing demand for larger service entrances, the Microlectric® BP320 Series offers unparalleled safety features and requires no external current transformer. It also meets the requirements of the 2015 Canadian Electrical Code. The future has arrived. The Microlectric® BP320 Series will help you meet the challenges. The only support on the market made especially for octogonal boxes. Meet 100% of pullout requirements with no external clamping. The latest in Thomas & Betts’ long line of renowned industrial cable termination products, the Kopex-Ex® ISR™ fitting was developed in Canada with input from end-users in the oil and gas industry. This is a high-level solution for industrial end-users looking for a superior-quality fitting that reduces installation time and costs while surpassing global standards for pullout requirements. Full line of stainless steel fastening solutions for tough environments. In corrosive and harsh environments, the wrong cable tie can lead to failure, causing expensive downtime and safety risks. Thomas & Betts offers Ty-Rap® high-performance stainless steel cable ties and accessories for long life and durability in even the harshest environments. They are ideal for bundling, mechanical fastening and identification-indoors, outdoors and underground (including direct burial). What if you could reduce project costs and benefit from local expertise? From unique tray features and high-performance products, to innovative splice plates and proven installation alternatives that minimize structural support requirements, T&B® Cable Tray provides engineers, installers and end-users with significant opportunities to reduce material and labour costs. What’s more, because T&B Cable Tray Systems are designed and manufactured in Canada, ABB can offer quick deliveries backed by local, expert service. ABB is committed to providing Canada’s oil and gas industry with the right solutions. Reduce structural supports and installation costs. One splice plate, two solutions. The NEW ultra-robust Super-Duty Splice PlateTM allows cost-efficient expansion by reducing the need for structural supports. It can also be used for sturdy mid-span splicing. Engineers, end users and contractors benefit from significant cost reductions without sacrificing quality or structural integrity. HelixTM Fitting - Go from horizontal to vertical, maximum cable protection, minimum space. Introducing the HelixTM cable tray fitting. Efficiency is in its DNA. Making transitions from horizontal to vertical cable tray runs has never been easier or more efficient. The latest evolution in cable tray fittings, the Helix™ fitting assembly was developed specifically for use in confined areas. It allows installers to transition from horizontal to vertical surfaces in less time, using significantly less space. Microlectric® now has a full range of service entrance mast accessories for 400 A overhead installations.